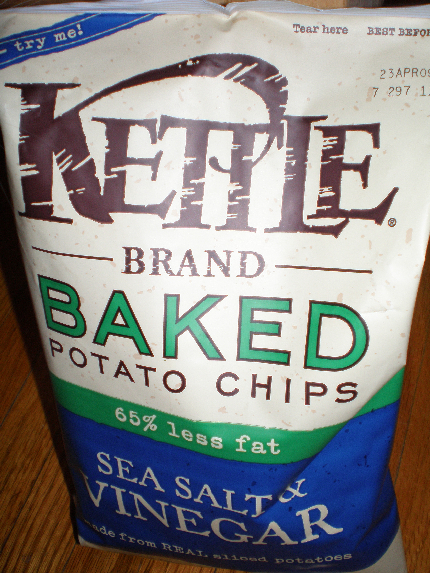 Okay, I know this isn't exactly a lesser known gem found locally in LA, BUT I just went to the bodega on my corner and discovered something genius: my favorite Salt & Vinegar Kettle Chips–BUT BAKED! Like any sane human being, I'm a salt & vinegar fanatic and this is really just a momentous event. Virtuously eating salt & vinegar chips? I wouldn't have dared to dream. Only out of Oregon, man. Just wait until I write my "Best Of Oregon" post and you guys all roll your eyes over how much I loved my road trip through that damn state. 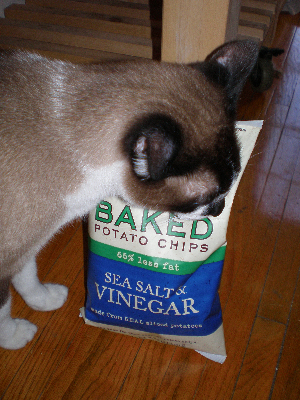 And speaking of obsessions, my cat Waldo seems to like them too . . .
Oh, silly Waldo . . . chips are for kids (named NORA). P.S. I should have mentioned: I got my chips at St. Regis market on the corner of Third Street & Orlando in LA. OK, J Market of St. Regis?